If you've been looking for a well-crafted game to invest some time on, I suggest Hero Core. This is Ultimortal's latest contribution to the retro game scene, and he pulls it off with lo-fi finesse I haven't seen since Alex the Allegator 4. Don't compare it to that game, though, as the similarity ends with the retro appeal. 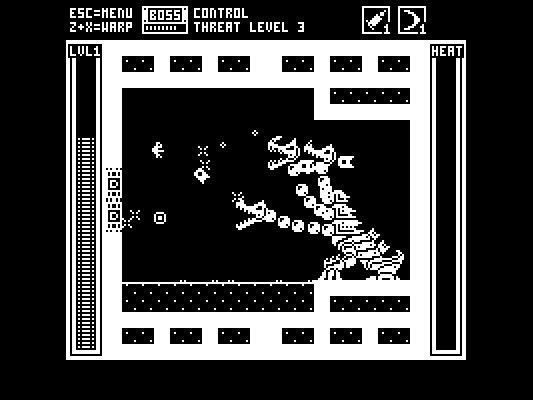 If you're compelled by beautiful black and white graphics, excellent nonlinear gameplay, and crunchy chiptunes, then you need not bother reading the rest of my review, because most of what I have is praise for this game. The game features a simple plot-- meek, benign protagonist goes on a quest to save the world from large, deranged robot-- which is deepened over the course of the game by short narratives that appear with certain achievements. It's a very verbose game, enough that you could jump in without reading the documentation and pick it up without a problem. * Hero Core is the sequel to another acclaimed game, Hero, although you don't need deep knowledge of the first game to enjoy this one. In fact, I find the sequel much more approachable than the original. What I find most appealing are the intense enemy battles that begin to increasingly dominate the game the further you go. They can be incredibly hectic and punishing, but never feel impossible. Hands down, the best parts of this game are the boss battles. There are excellent meaty graphics for all of them, each behaves creatively, and the game features a large handful of them. The pacing of Hero more or less revolves around your boss encounters, and they do not disappoint. Additionally, you can play the game through on different difficulties, and each difficulty features an entirely different map. The bosses become far more interesting (and maddening) on higher difficulties as well. As you defeat bosses, you are rewarded with upgrades for your character. There were times when I felt the bosses were unbalanced in difficulty-- some I defeated on the first try, and others took many, many tries. You're not really required to beat any of the bosses, though, except the last one-- the map is freely explorable-- so this doesn't cripple the game if you are short on patience. There are several other things I could champion about this game, but the most important things I want to mention are the wonderful sound and music. Have you ever become so attached to an old game that the primitive bleeps of pain and happiness start to really carry emotion for you? Hero Core pulls it off. Along with this comes an album of original chiptunes that range from suspenseful to adrenaline-boosting. Together, the tracks make some of the most effective original music I've heard in a Game Maker game. Great music and sound design are so often overlooked in otherwise good games that I think Hero Core deserves special attention for this. The verdict: Hero Core is worthy of being sold on a cartridge. As a reference, it took me 2 hours 45 minutes overall to beat the game on Normal, with two dots at the end of my save file, and I've played about half the game on Hard. I'm sure most people in this community will do much better than me. They will probably beat that damn elusive ghost boss. * You can also play it in several different languages, including Engrish. Flip Hero returns for the final battle against his nemesis, Cruiser Tetron - but can he really stop the reign of the machine warlord for all time? Beating the game on either difficulty unlocks a bonus screen with additional game modes, maps etc. Getting 100% computers, bosses and exploration will only add dots to the end of your savefile, rather than unlocking more stuff. Thanks to Brother Android for the game's music! Recommendations: The 5 people who like Hero Core also like the following games. I saw the DeceasedCrab playthrough of this. I liked how it's more "Game Boy" and less "Atari 2600" like the original Hero was. And multiple endings! -2 points for that insufferable sound effect that plays when an "invulnerable enemy surface" is struck. That constant "ping!ping!ping!" during the final fight was almost game breaking. Wow! Has a great Metroid vibe, lots of action, a well implemented save feature, and nice retro graphics. Just a great game overall. Hell yes, Hero Core was one of the best GM games I have played in a while. The music superb and the retro action second to none! Yep, Hero Core was quite the game. I had eagerly anticipated its release, and it did take me a while to beat... the action was its strongest selling point.